An interesting remake of the 1937 Robert Montgomery thriller, the 1964 shocker ‘Night Must Fall’ takes the stagy original and adds some shocks to this story of a psycho who preys on women who fall for his outward charms. After murdering and beheading a local woman, child-like psychopath Danny (Albert Finney) charms his way into the home of the invalid Mrs Bramson (Mona Washbourne) and her young daughter Olivia (Susan Hampshire). Mrs Bramson is taken with the young man and sees herself as a new mother to him, as Danny lost his when he was only 6. Although she finds Danny odd and unstable, Olivia falls for the handsome and funny charmer, until one stormy night when barriers break down and Danny’s thoughts once again turn to murder. A pet project for Albert Finney (who served as co-producer), ‘Night Must Fall’ came a year after the multi Oscar-winning ‘Tom Jones’ (’63), and reunited Albert with his ‘Saturday Night and Sunday Morning’ director Karel Reisz. Finney gives a multi-layered performance which is very creepy at times, being both child-like and terrifying. Danny’s mental breakdown in the final scene as the camera pans away from him, is especially powerful and shows Finney at his very best. 27 year old Susan Hampshire has a good early role here, and looks beautiful in some stark close-ups. Veteran stage actress Mona Washbourne is excellent as the aristocratic and lonely Mrs Bramson, and would co-star in another psycho-chiller the following year; William Wyler’s ‘The Collector’ (’65). Other support comes from Sheila Hancock’s pregnant housemaid, and Michael Medwin as Olivia’s boyfriend. Clive Exton adapted Emlyn Williams original play and the camerawork from the masterful Freddie Francis is a standout. The country home setting is magnificent with its crowded woods and leafy lakes, which provide Danny with plenty of choices to cover up his crimes. The opening axe murder and dumping of the body in the lake, is startling and certainly wastes no time in letting us know the type of person Danny is. As well as the climatic showdown between Danny and Mrs Bramson, the most powerful scene is Danny’s final bathroom breakdown, which is both chilling and strangely heart-breaking. There are some interesting police investigation scenes which I hoped would have been more suspenseful, especially when one local bobby begins snooping in Danny’s room and asking about the hat-box (which Danny keeps his souvenir in!) on top of the wardrobe. It was fun spotting a cinema marquee showing ‘The Great Escape’, something poor Mrs Bramson could have done with! As a whole, I think the movie is a bit uneven with some disjointed scenes of Finney alone in his room, acting bizarre and paranoid. Although they do serve to highlight his mental state, I found them off-putting at times. There are plenty of creepy moments though, especially when showing a playful Danny alone with Mrs Bramson. A chilling and sometimes startling shocker, ‘Night Must Fall’ is a forgotten thriller which benefits from repeated viewings. Considering the talents involved, it should have been better. 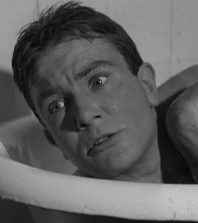 Still, it does make for a creepy late-night viewing, and Albert Finney’s tour-de-force performance reminds us why he is one of the finest actors of any generation. 2 Comments on "“Albert Finney Took An Axe…” – Rediscovering ‘Night Must Fall’ (UK 1964 – 101 mins)"
Great shocker….I saw this on the late late late show as a kid in Long Besch, Ca..My mom remembered the 1937 film with Robert Montgomery and Rosiland Russell…but nothing beats Finney for leering insanity.. Although this is not one of my favourite Finney movies, he’s always watchable and (as always) gives an excellent performance.